There are a variety of reasons dark spots can appear on our faces. If you're a sun worshipper, it could be a side effect of too much UV exposure. For the skin-picker, it's likely you're familiar with scarring, or the dark spots left over from acne. And some conditions that cause dark spots, like hyper-pigmentation or melasma, seem to come from nowhere and heal only with time. While we believe in fully embracing your skin, and all its perfect imperfections, we also understand that sometimes these spots can be a nuisance. That's when we like to bring in one of our favorite natural alternatives to help brighten your look. It's a plant called uva ursi, also known as bearberry. The plant likes cooler climates, such as those in northern Europe, North America, and Asia. The leaves stay green all year, with flowers blooming in the summer and then turning into bunches of red and pink berries. Uva ursi extract is pulled from the leaves of the plant, which have long been used to treat urinary tract disorders, including infections of the kidney, bladder, and urethra; increased urination; painful urination; and urine that contains excess uric acid or other acids. It’s also been used to treat constipation and bronchitis. So popular was this plant for the treatment of urinary tract infections that it was the common treatment for the condition, right up until the discovery of antibiotics. In skin care, we like uva ursi because it can help brighten your look. But aside from that, it's packed full with nourishing antioxidants and astringent properties. These are just a few of the benefits of this powerhouse plant. 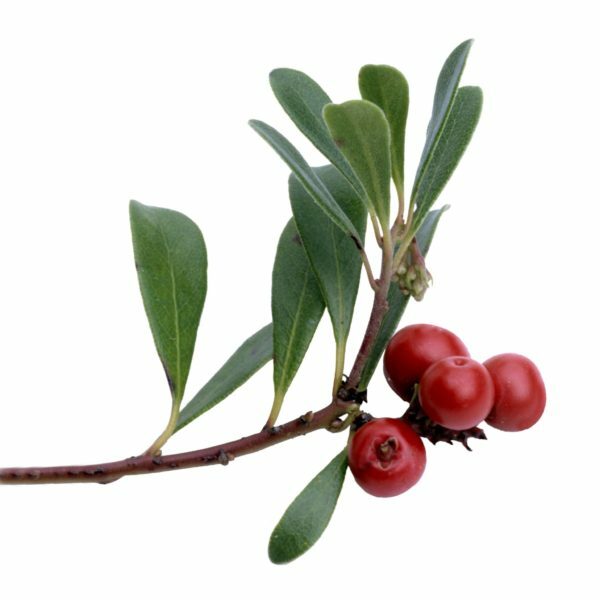 To get all scientific, uva ursi is one of the only natural sources hydroquinone. This is the compound that helps to lighten the appearance of skin, and especially goes to work on dark spots. Like most plant extracts, uva ursi comes complete with other nutrients, including antioxidants that provide natural protection against environmental stressors. The extract has natural cleansing properties, which help minimize the appearance of pores, helping skin to appear smoother and more uniform while reducing puffiness. Uva ursi is a gentle astringent, which means that while it minimizes the appearance of pores, it can also help tighten and firm your look. Uva ursi is included in our formulations for the Citrus Stem Cell Serum and the Illuminating Pearl Mask, two products that help reduce the appearance of dark spots for smoother, more even looking skin. Try it and let us know what you think! Have you used uva ursi in your skin care? Share your experience in the comments below. Uva Ursi can be found in our products, but if you wanted to purchase just the herb you’ll want to check out a place like Mountain Rose Herbs! Does using Uva Ursi topically cause any adverse side effects? I liked it but I didn’t realize how much it was working until I ran out and my spots started getting dark again. I use it every day now.